The Carmel 450 is an ultra-compact accent/flood fixture for use with T6 ceramic metal halide lamps. 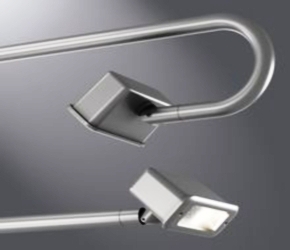 Its rugged, contemporary design and wide array of mounting options make it ideal for architectural, landscape, and sign-lighting applications. The adjustable mounting stem provides a full range of aiming from any mounting position. Lumiere's exclusive Siphon Protection System (S.P.S.) prevents water from siphoning into the fixture through its own lead wires.